The new president of the United States is unpredictable to both his supporters and rivals, both at home and abroad. World leaders are wondering if President Trump is going to stick to his campaign promises, and how that’s going to affect the rest of the globe. How will Trump’s policies affect America’s standing in the world? What will happen to America’s traditional allies? Who will be the US’ next enemies? What will be left of Obama’s foreign policy legacy after Trump takes over? We ask the man behind the idea of soft power, one of America’s most influential scholars, former assistant defense secretary – Joseph Nye. Sophie Shevardnadze: Joseph Nye, former assistant to Secretary of Defence, who also served as an advisor to the U.S. Secretary of State John Kerry - welcome to the show, it’s a great pleasure to have you with us. Now, Dr. Nye, you say that the U.S. has two kinds of presidents - visionary presidents like Ronald Reagan and manager presidents, like George Bush Senior. Which category would Donald Trump fall into? Joseph Nye: We don’t know yet, obviously, because he’s brand new and hasn’t taken office, but it’s hard to see him as visionary because he hasn’t been able to express a vision. On the other hand, he has expressed several visions, so… he may turn out in that category, but at this stage, it’s impossible to give a good answer, because he is very mercurial, he often says different things during his campaign - so we don’t know which is the real Donald Trump. SS: So, you’re afraid to assume, you haven’t made up that image of him yet for yourself? JN: No, I’m prepared to wait and see how he behaves when he’s in the office. Some people say, when he’s in the office he will be “very presidential”. I expect that he may continue to be quite unconventional. This is our first President who uses Twitter as a daily instrument for his own purposes, which is an illustration of his being unconventional. We’ll have to see to what purposes he uses that. SS: So, does Trump’s promise to focus on internal affairs more is going to undermine American soft power in the world - that is, American appeal to other countries? JN: Not necessarily, it depends on how he does with his internal reforms. To the extent to which his campaign was divisive, then it may actually hurt American soft power, that, after all, the soft power is the ability to get what you want through attraction rather than payment or coercion. The low quality of the debate and the rhetoric during the presidential campaign, I think, hurt American soft power. You have to see whether that continues as President. SS: But as you say attraction is in the eyes of the beholder… We’re seeing politicians with more radical views becoming the focal point for change in Europe, especially after the Brexit in the UK. Does that mean that Trump’s win can actually boost America’s appeal across the Atlantic? JN: It may boost the appeal for somebody like Marine Le Pen who’s running for president in France. I doubt that it will, for example, boost the view of America in Angela Merkel’s Germany. So, it will vary from case to case. SS: You also said that the populist backlash we’re seeing in 2016 is temporary, and that won’t hold off the advances of globalisation. But the protest votes have skyrocketed. Surely, this means something is seriously wrong with the status quo, no? JN: The populist backlash that we’ve seen, has, basically, two roots: one is economic, and to the extent which international trade has led jobs to migrate to less developed countries like Mexico or China and made people lose their jobs - those people are then attracted to a populist candidate, who promises to get their jobs back. But there’s another dimension to it as well, which is cultural - the feeling that immigration and changes in gender relations, male-female and so forth - these threaten the status of older white men, and you find that they disproportionately voted from Trump in the U.S., or for Brexit in Britain. Younger people in Britain, for example, poll showed, that the majority of them wanted to stay in Europe, but older people tended to be more opposed. SS: The matter of the fact is, we still have millions who voted against the system. Will their force it to adapt and change? JN: I think that’s correct, but we don’t want to over-interpret the American vote. Remember, while Trump won the Presidency, because of a hundred thousand voters in three states, in the Rust Belt of America, Hillary Clinton won the popular vote by 2.5 million votes. So, it wasn’t as though the overwhelming majority of Americans voted for Trump. It was an election that was decided on about a hundred thousands votes in three states in the North-Central, which suffered from the de-industrialization. SS: Now, you said that a that a combination of hard power - that is military and economic might - and soft power is needed in foreign policy - can Trump strike that balance? JN: We’ll have to see. Again, I’m withholding judgement, because he’s innovative man, he’s unique, he’s not conventional, and he may be able to strike that balance. On the other hand, if you look at his campaign, I think that he didn’t quite get the balance right. I think his rhetoric was excessive and divisive, and as I said, I think that hurt American soft power. But we’ll have to see as he becomes president and designs policies rather than campaigns - we’ll have to see how he does with combining hard and soft power. SS: Trump has promised to revive relations with Russia - and you agree that there’s plenty of overlapping interests between the two powers. Trump’s a businessman without the shackles of ideology - will he put an end to the new Cold War we’re in now? JN: I hope we’re not in a new Cold War. I’ve written that nobody benefits from a Cold War and I think the U.S. and Russia have to have business-like relations with each other. So, if Trump is able to deal with Putin in a business-like way - that will be good. On the other hand if Trump says that he will reverse the sanctions that were placed on Russia after Russia’s invasion of Ukraine - then I’m not sure that’s good, and within his own Republican party you have a number of people like John McCain, who’s Chairman of the Senate Foreign Relations Committee, the Republican chair, who would oppose the lifting of sanctions. So, I hope business will be done, but I think if Trump tries to pretend that nothing happened in the past, that will cause him troubles inside the U.S., and as well as its allies. SS: You’re saying that America’s role in Syria should be limited to containment rather than direct military involvement - so far, that was Obama’s policy but it’s failed to achieve any tangible results. Why do you think continuing on this path will bring about anything meaningful? JN: I think that the best we can hope for is that the Syrian civil war will come to an end, and stop this terrible humanitarian catastrophe as well as the generation of large numbers of refugees. So, at this point, having a military victory may be better than trying to see a situation where so-called “moderate” rebels prevail - it’s not clear who they are or where they are. There’s still a strong interest that both Russia and U.S. share in defeating ISIS, radical jihadists, but we might wind up seeing Syria which will be divided between some almost cantons or areas controlled by the Assad government in the West, some areas which will have heavy Kurdish influence in the North, and some areas in the East where the key problem will be to defeat ISIS and to find a government which could be stable. At this stage, I don’t think anybody has good answer to how handle Syria. SS: Do you think some kind of resolution for Syria is more likely under Trump, since he says he’s willing to explore all option - perhaps, even talk to Assad? He doesn’t exclude that option. JN: That may be in fact where we wind up - it may turn out that given the situation on the ground in Syria, that the differences between Russia and the U.S. government under Trump will diminish and that we might be able to see an end to this terrible bloodletting that is going on in places like Aleppo right now. SS: Trump’s national security adviser General Michael Flynn has advocated a global campaign against radical islam - he told me in an interview that the U.S. needs to step up its fight against ISIS - so do you expect that to happen? JN: I think that the Trump Administration guided by Flynn as NatSec advisor will certainly take steps that look like stronger steps against ISIS. On the other hand, if you look at the fact that the U.S. has been bombing ISIS and has had special operation forces on the ground fighting against ISIS in both Iraq, Mosul, and in Syria near Raqqa - I think you already see quite a campaign against ISIS. I think, under Trump this may be strengthened somewhat, but I think it would be a grave mistake for the U.S. to put large numbers of ground forces into Syria or Iraq, and I would not expect Trump to do that, given his own past criticisms of Bush's actions during Bush-43, during the Iraq war. SS: The U.S. is pursuing an active military role against ISIS in Iraq - aiding the Iraqi military in retaking Mosul, for instance. Iraq’s army was defeated once before by ISIS, should the U.S. be trusting them to lead the battle this time? JN: The Iraqi army is a mix group. There are some units which have been trained and which are quite active and able, there are other units which are not very good, many of whom were defeated and fled during the earlier period that you’ve mentioned. There are also some questions related to groups of Shia militia that are becoming involved. Given the Sunni composition of Mosul, it’s important that the troops which are well trained and have large numbers of Sunni participants, should be taking the lead. SS: The American involvement in Syria, like you said, comes from the historic belief that Americans are different, that they have the power and the duty to decide for others how they should live. After a string of failed nation-building projects - Afghanistan, Iraq, Libya - why is this idea still alive in the U.S.? JN: I don’t think that that’s quite an accurate picture of… Certainly, not an accurate picture of my views, but also of many Americans, that we tell other people how to live. I think we like to allow other people the choice of how they live, and if you look at Afghanistan, where the Taliban were trying to impose a rigid form of Islam upon people, particularly women, I think the feeling was that we could try to help the moderate to resist that, so that they could make their own choices. Similarly, I think that would be true in Iraq and Syria. But, the idea that Afghanistan would turn out looking like an American democracy or even a Swiss democracy doesn’t strike me as plausible. JN: Libya, I think, there’s a difference between that sort of unrealistic aspiration of guiding how a country organizes itself internally, and the efforts to try and protect groups who want to avoid being controlled by extremists, and I think, groups like the Taliban in Afghanistan or ISIS in Iraq or Syria are not providing any options or choices for those whom they will tyrannise. JN: Libya is a harder case. I think the mistake there was the mission change to regime change - that was under the influence of the Libyan rebels, and then, after Gaddafi was removed, there wasn’t enough done to try and provide stability in Libya and to have a stable government. Ideally, it would have made sense to have international or UN peacekeeping troops, which could’ve included Russia, China and other countries. But that opportunity was missed and what we would up with is a chaotic situation and then we found that ISIS and the radical jihadists took advantage of that chaotic situation. So, in that sense, I think, it was a mistake. SS: Obama’s nuclear deal with Iran may be challenged by the president-elect, he also said he’ll cut the newly revived ties with Cuba - will there be anything left of Obama’s foreign policy efforts after Trump takes charge? JN: Well, we don’t know whether these statements which grew out of the campaign will actually prove to be the policies or not. If Trump were wise and if he were to follow some of the advice that the newspapers say he’s getting from some of his close advisors, he will not tear up the Iran agreement. This is an agreement which had backing of not just the U.S. and Europe, but also Russia and China, and I think, in that sense, for the Americans to exit that agreement unilaterally would isolate the U.S. and would be a serious mistake. It would also set back the efforts to prevent Iran from developing a nuclear weapon, and I hope that if his people in his own circle tell him that, he will realize that this is a case where he should back away from his campaign rhetoric. On Cuba, I don’t know what he’ll do. I imagine he’ll do some things to sound tougher about Raul Castro and the Castro regime. I don’t know if there’s going to be a big change, because, in that case, unlike Iran, you didn’t have major removal of sanctions or efforts to stop something like a nuclear program. So, to some extent, I thought Obama was correct to recognize Cuba, but it’s not nearly as serious of a question as the Iran question. The Iran question, if Trump were to tear up the agreement, could destabilize the region. On the Cuban case, I think it would be a mistake, but it’s not going to destabilize Latin America. SS: Trump promised to be tough on Beijing and threatened a trade war against China. After the election he vowed that the two nations will have ‘one of the strongest relationships’ - so which will it be? JN: When you look at the depth of the economic interdependence between the U.S. and China, you’ll realize that it will be expensive, both to China and to the U.S., to try to impose tariffs or to create a situation where you tear that economic interdependence apart. I think, as a businessman, Trump will realize that, but, again, I can’t promise! SS: You believe the U.S. does not need to contain China. Then why all this effort to do exactly that? Is that all just a waste of energy? JN: ’Containment’ would mean that there will be no trade, no exchange of peoples and so forth. In fact, there’s a lot of trade with China, as I’ve mentioned, and there’s something like 300,000 Chinese students in American universities. ‘Containment’ if we think back to the bad old days of the U.S.-Soviet Cold War, ‘containment’ meant that there was almost no trade between Soviet Union and the U.S., but also very little social exchange. There were very few students in each other’s countries. So, I don’t see the policy that the U.S. has had towards China as containment, I think the right way to describe it, as I’ve written is integrate but hedge. SS: Trump criticised NATO for being a financial burden on America and European leaders are already preparing plans for its potential withdrawal from the alliance. Is Trump’s anti-NATO stance a gamble to make allies pay their fair share? And will it work? JN: I suspect that it is a tactic of a man who has grown up as a entrepreneur in a real estate business, in which you try to strike a tough bargain or get a better bargain by pretending that you’re going to walk away from a deal. I think that’s what really behind Trump’s rhetoric here. The people who are surrounding Trump, somebody like General Mattis who is likely to be Secretary of Defence, if confirmed by the Senate - are pro-NATO, and they’re not likely to advise him to take positions which would actually tear NATO apart. Again, here you can find different statements, that suggest different paths, but on this one I feel a little bit more secure in making a bet that Trump will not do things which will damage NATO. SS: Many people over this side of the world believe that the uni-polar world era of 90s has clearly come to an end. Are American aspirations to lead the world becoming unsustainable, even though it’s still the leading global power? Do policymakers in Washington realise that? JN: Unipolarity was always somewhat exaggerated, but it is true that in the 90s, after the collapse of the Soviet Union, there was no power that balanced American power, and, in that sense, that period has come to an end. I recently wrote a book called “Is the American Century Over?” and by that didn’t mean American hegemony, I mean a period since 1945, when the Americans were more powerful than other countries. I think that’s going to continue for some time, but being more powerful than other countries, or being the largest power, is not the same as being able to control other countries, and it’s not the same as unipolarity if that implies the American hegemony where Americans could rule. So, what I argue in this book, “Is the American Century Over?”, is that no, but it’s going to look very different than it did, because one of the key problems is how do you organize collective action on things like, let’s say, climate change, where we all have an interest in cooperating together, but organizing cooperation is not going to be easy, and neither the U.S. nor anybody else is going to have a power to do this alone. SS: Thanks a lot for this lovely interview. Dr. Nye. 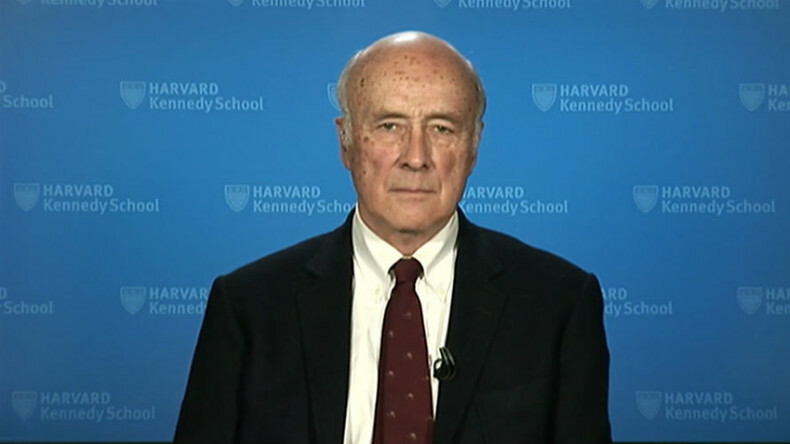 We’ve been talking to Joseph Nye, Distinguished Service Professor at Harvard, member of John Kerry’s Foreign Affairs Policy Board, discussing what lies ahead for American diplomacy with the election of Donald Trump as president. That’s it for this edition of SophieCo, I will see you next time.